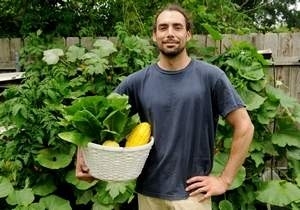 Sunshine, water and nutrients yield super-sized squash in Ed Clement's Shreveport backyard. A stint as a student researcher at the LSU AgCenter jumpstarted his interest in soilless gardening. In 2011, he rigged a hydroponic trough with materials from home improvement retailers. He refined the idea this year and started the plants in March. Two months later, tomatoes, squash and lettuce tangle their roots in the homemade troughs attached to a south-facing wooden fence. Pumpkin vines creep along the yard and up the fence. "The plant is able to devote more of its energy to the flowering portions if it doesn't have to devote energy to the roots to get nutrients and water," Clement said. Agricultural research and commercial hydroponic production includes more than pure water-based systems. LSU AgCenter's Red River Research Station in Bossier Parish grows hothouse tomatoes in perlite, a mineral that puffs up "just like popcorn" when heated, said Hanna Y. Hanna, who oversees greenhouse tomato research. Confused by all the "hydro hype"? Not sure whether you want to set up an ebb 'n flow or a top feeder? Get your feet wet with our free "mimi-farm" plans here: 4 Simple Systems. Or if you are ready to build a full-sized, super productive garden, check out our ebook, which thoroughly describes the different systems, explains the pros and cons of each setup, and so helps you decide which one would be best for you. And no matter which system you decide on, you will always have complete plans for all the setups, so you can try another system later if you want to. Just keep your ebook resource stored on your hard-drive or a CD for later use. Then print out only the section you need to construct each garden, and refer to your construction guide as you build. Simple! Hydro Tip of the Month- Critters!